I agonized for months about buying a new vehicle. I wanted to drive my old car for as long as I could. It was paid off so I wasn’t looking forward to having a car payment again. I also remember the stress I felt buying it back in 2006. I wasn’t looking forward to visiting multiple dealerships again and dealing with the pressure of sales people. However, things took a turn for the worst back in the fall. My car was breaking down constantly. I was spending between $400 to $600 a month on repairs and tow trucks for a couple months. The final straw for me was after I picked it up at the car repair shop after it had been “fixed”. As I was driving home, I could barely turn the wheel! My power steering had died. I told John that enough was enough. I was done. I wasn’t putting another penny into the car and it was time to buy a new one. With two kids, I needed a reliable vehicle that wouldn’t nickle and dime me every other week! I started the car shopping process online and then went to look at the dealerships after hours. My dad helped me pick out a new vehicle and I’ve been driving it since December. So far so good! The next time I need to buy a vehicle, I’ll be doing things a little differently. For starters, I’ll be using the new Canadian website, Carmigo. 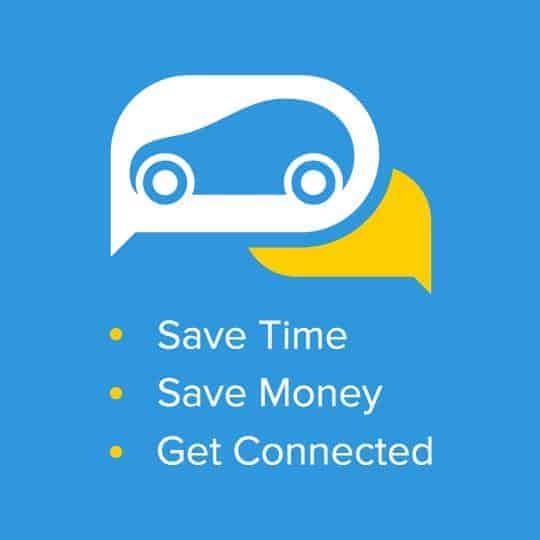 It connects buyers with multiple salespeople online in real time to help improve the car shopping experience. Shop for vehicles from the comfort of your home, work or even your phone through their mobile app (coming soon)! Communication is done through Carmigo and the best part, in my opinion, is that you can remain anonymous until you decide you are ready to take the next step and visit the dealership! Carmigo is a good thing in my books! First off, it’s free and simple to use. All you need is an Internet connection. I don’t know of any Canadian site like it! Seven out of 10 Canadians find the car buying experience stressful, me included. I feel intimidated by the salespeople and doubt creeps into the back of my mind. Am I getting ripped off? How do I know I’m getting the best deal? Do I really need all these extras? These are questions that many of us have. Did you know that only 11% of Canadian car buyers trust a typical car salesperson? That’s not a whole lot of trust! Carmigo did some research and had a few other interesting findings that I wanted to share. Take a peek at these stats and see where you fit in. Yes, yes and yes to all of these! Buying a new car gave me a pit in my stomach and I’m glad the experience is over with for the time being. I think using Carmigo will change how you feel about the whole experience. You’ll save time and money and can buy the car you want on your own terms when you are ready. You won’t have to drive to a bunch of dealerships and talk to salespeople. That process is done all online with you in control. After you build your car, selecting the year, make, body type price and other options, Carmigo will connect you directly with dealerships in your local area. Another perk of using Carmigo is that salespeople will be more inclined to give you the best deal possible since they know you are actively checking out other dealerships. After all, they want your business! You can communicate with the salespeople in real-time through Carmigo’s instant chat feature. Remember they don’t know what your phone number or email address is until you decide to take the next step. I love the fact that you can remain anonymous. Register for free online at Carmigo now. The Carmigo app will be available on iTunes by the end of April and in the Google Play store in about 2 months so be on the lookout for it! Spread the word about Carmigo to your friends and family. I’m telling everyone I know who is car shopping to use this site! How do you feel about shopping for a new car? Will you use Carmigo the next time you are looking for a new vehicle? 30 Popular Recipes You Need to Pin! Oh I’ll have to tell hubby about this, if he already doesn’t know…..We’re on the hunt for a new car! Oh I wish I had known about this back in Dec!! Thank you I’m saving it now. Perfect timing! Thank you. I am one of those that doesn’t trust the salespeople…. We’re actually looking for a second car, so this really helps! I love that you can customize everything you’re looking for! This sounds like a fantastic way to car shop! I hate the pressure the car salepeople put on you its crazy! We just finished car shopping ourselves. We searched online and zoned into exactly what we wanted. We were lucky enough for find a large and reputable dealership that accommodated us. We flatly said what we want and how much we have to spend. We bought the car after the test drive.